Atlas and the Anchor: Iron & Wine - "Kiss Each Other Clean"
Sam Beam and Iron & Wine return today with their fourth album Kiss Each Other Clean, the first since The Shepherd’s Dog, released over three years ago. Producer Brian Deck and collaborators from avant-folk band Califone again return to place their indelible stamp on the album, but Sam Beam’s inviting vocals and lyrical imagery are still in the spotlight. Continuing his shift from the intimate folk of his past, he delves into 60’s and 70’s pop and funk for one of his best albums yet. “Walking Far From Home” opens the album with a hazy atmosphere and layers of vocal harmonies. Standout track “Me and Lazarus” bounces on a big, funky bass line and skronky saxophone solos, bringing a new dynamic to their already experimental sound. “Tree By The River” features Beach Boys-inspired vocal harmonies and glockenspiel for a breezy and warm AM radio sound. “Monkeys Uptown” combines both the artificial and natural with the electronic blips and beeps Brian Deck is known for combined with gorgeous vocal melodies. “Half Moon” and its doo-wop vocals and country twang sounds like Motown broadcast from the South. “Rabbit Will Run” stands out with its 70’s jazz outro complete with vintage organ and clarinet solo. 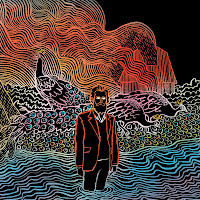 Another standout, “Godless Brother In Love”, features vocals from Doveman and is a pretty piano-led ballad the Iron & Wine fan is more accustomed to. “Big Burned Hand” should appeal to the hippie crowd with a swampy, strutting 70’s funk groove and more skanky horns and synthesizers. “Glad Man Singing” is a slice of James Taylor-like soft rock. The seven and a half minute “Your Fake Name Is Good Enough For Me” makes for the perfect album closer, blending all of the elements of the album into one track. For his first major label album, Sam has pulled out all of the stops creating an album in HD-quality that feels like the natural progression of his music for his best album yet.